We love a water view: This pet-friendly Falmouth motel is directly across the street from Falmouth Heights Beach and overlooks Vineyard Sound. Free Wi-Fi access in every room and a happening British pub keep guests smiling. 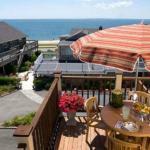 Each of the 23 non-smoking rooms at the two-story Seaside Inn includes free Wi-Fi cable TV and a coffeemaker. Select rooms offer a balcony and ocean views as well as a kitchenette and jetted tub. Seaside guests regularly flock to the inn's pub the British Beer Company for hearty eats such as Meatloaf Maximus and shepherd's pie dozens upon dozens of beer varieties such as Cape Cod Red (of course) and jammin' live entertainment. Pets are welcome and an outdoor sitting area is available. Parking is free. The Seaside Inn is a little more than 17 miles from the Bourne Bridge and two miles from the shops and restaurants of Falmouth Center Inn. The Island Queen ferry is just over a mile from the resort; from there Martha's Vineyard is a 35-minute ferry ride across Vineyard Sound. Salt Pond Bird Sanctuary and its nature trails are a little more than six miles away. Boston's Logan International Airport is 76 miles away.